Family legend has it that my husband was the first Jewish baby to be born in the newly rededicated Jewish hospital in Berlin, on May 8, 1948. His father was extremely relieved that he was born on Shabbos, because it meant that he would not need to provide the customary cigarettes for attendees at the bris, which in post-war Germany could be obtained only at a very high price on the black market. Because of the extreme food shortages, the usual fare consisted of a little kichel (cake or cookies) with black market cigarettes and shnapps. Now he only had to worry about the kichel and the shnapps. But besides the incredible awe and miracle of celebrating the birth of a Jewish child amidst the ashes of the Holocaust, it was especially meaningful that my husband’s bris was celebrated on the day announcing the creation of the State of Israel, Israel’s very first Independence Day. 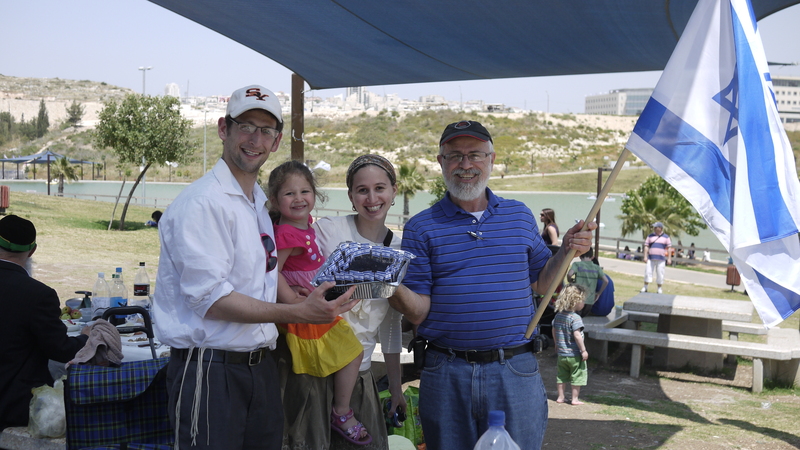 So when my daughter pulled out a surprise birthday cake decorated with 64 tiny Israeli flags (instead of candles) at our Yom HaAtzma’ut (Israeli Independence Day) picnic at the beautiful park in the town of Modi’in, my husband was quite touched. 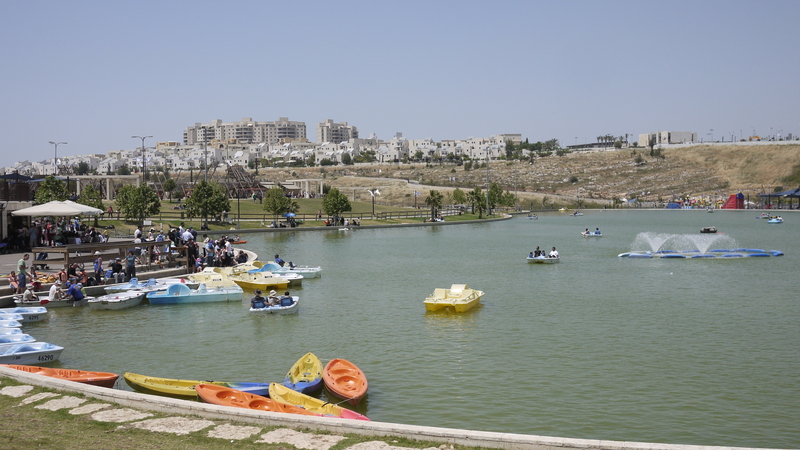 As we started to sing “Happy Birthday,” suddenly all the nearby Israeli picnickers – – Sephardi, Ashkenazi, religious and secular – – joined in the singing, and then repeated the Hebrew version of the song. Everyone shouted “Mazal tov!” and came over to my husband to shake his hand or caress his shoulder. Someone handed him a giant Israeli flag and insisted we take a family picture. Happy Birthday! And to my spouse: yes, I will still love you, and I'll still need you, when you're 64 . . .
After my husband stopped blushing from all the unexpected attention, there was only this thought: how special it was to be surrounded by family – – not only our daughter, son-in-law and granddaughter, but the family of klal Yisrael. Hinei mah tov umah na’im, shevet achim gam yachad. How wonderful it is to sit together with our brethren! 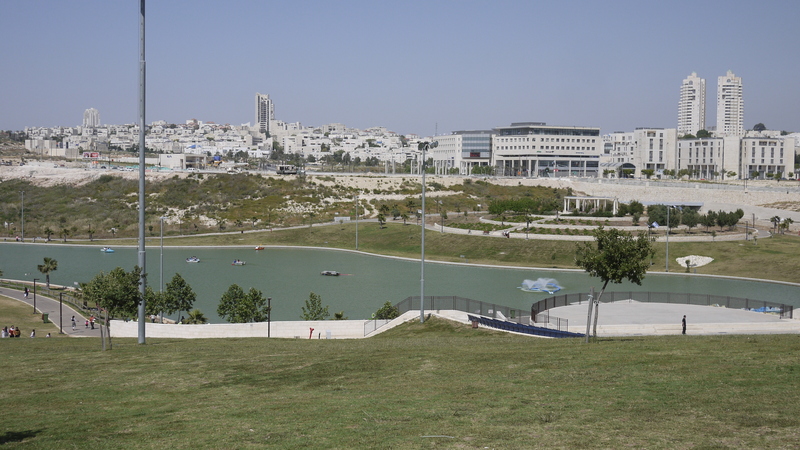 And now for some photos of the huge, gorgeous new planned city of Modi’in, with its man-made lake, one of it many playgrounds, and a small portion of the impressive housing. 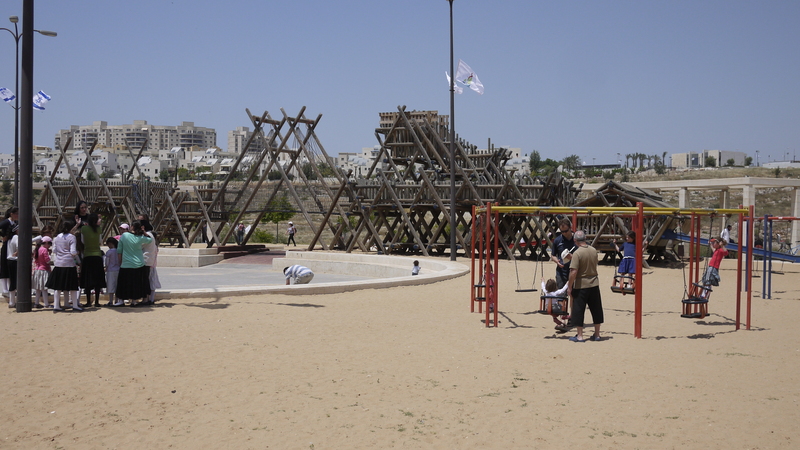 Construction began in what was a desolate area in 1994. In 2009 there were 46,000 residents; in 2010 there were 74,000 residents, and there are plans for a total of 240,000 residents, which is not at all unrealistic based on the town’s popularity. 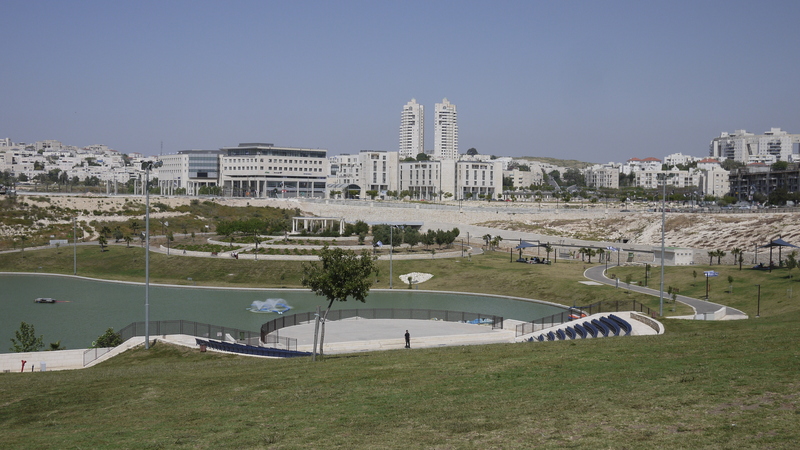 Conveniently located approximately halfway between Tel Aviv and Jerusalem, with many new shortcut bypass roads that dramatically cut commute times, plus a new train line under construction, it is one of Israel’s cleanest cities, too. There are free wi-fi connections throughout the city. Real estate prices have increased dramatically in the past few years. 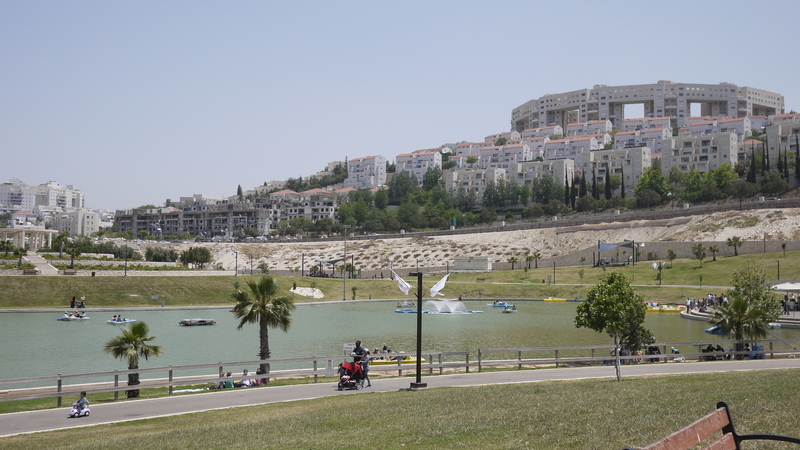 This is only one of many hills, residential, and shopping-filled areas of the city of Modi'in. When I booked our tickets, I hadn’t realized that our plane would land on Israel’s Memorial Day and the eve of Israeli Independence Day. That means that everything would be shutting down in honor of the holiday, and that included buses and trains. So our son-in-law was kind enough to rent a car and pick us up at the airport and bring us back to their home in Be’er Sheva. On the way home we discussed Memorial Day. Tragically, there is practically not a single person in Israel that has not lost a father, uncle, grandfather, brother, cousin or nephew to war or terrorism, and it’s a very solemn day. At 11:00 a.m., an air raid siren sounds throughout the country. At that moment, everyone and everything comes to a grinding halt. Even people in cars pull over to the side of the road, get out of their car, and stand at silent attention for one full minute in remembrance of those who gave their lives for Israel. Our son-in-law, who is a medical student at Ben Gurion University at the Medical School for International Health, happened to be on surgical rotation when the siren went off. He described how moved he was to see patients in pre- and post-op struggle out of their beds to stand at attention, and those who were bedridden and lay prone attempt to sit up in their beds as a sign of respect. At 11 a.m. my daughter was at the supermarket, with its usual commotion, crowded with shoppers. Due to the noise within the supermarket, not everyone heard the siren at first, and slowly people began to realize what was happening, and then the market grew silent as people stopped what they were doing and stood quietly next to their shopping carts. Only moments before the venue had been a bustling scene of commerce, and now, during the siren, a surreal picture of silence and stillness. Then the siren ended, and it was back to noisy shoppers pushing their carts and haggling over merchandise once again, almost as if nothing had happened only seconds ago. 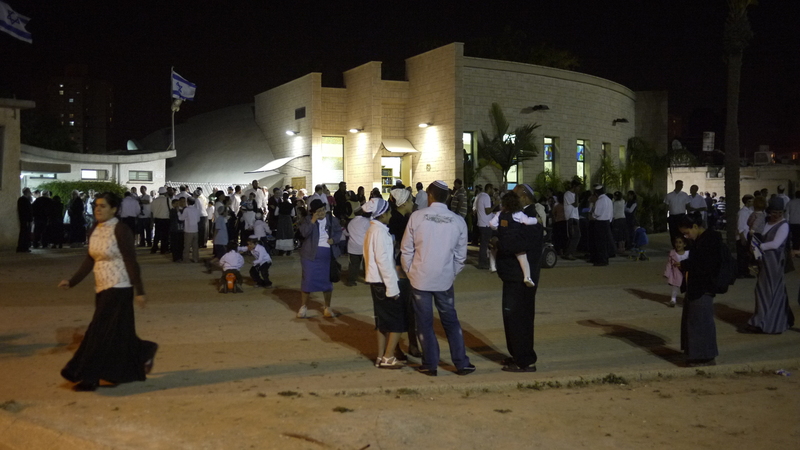 People gathering outside the "Kipa Shul" on Rehov Tzvi in the Shechuna Hey neighborhood on in Beer Sheva, at the onset of Independence Day. 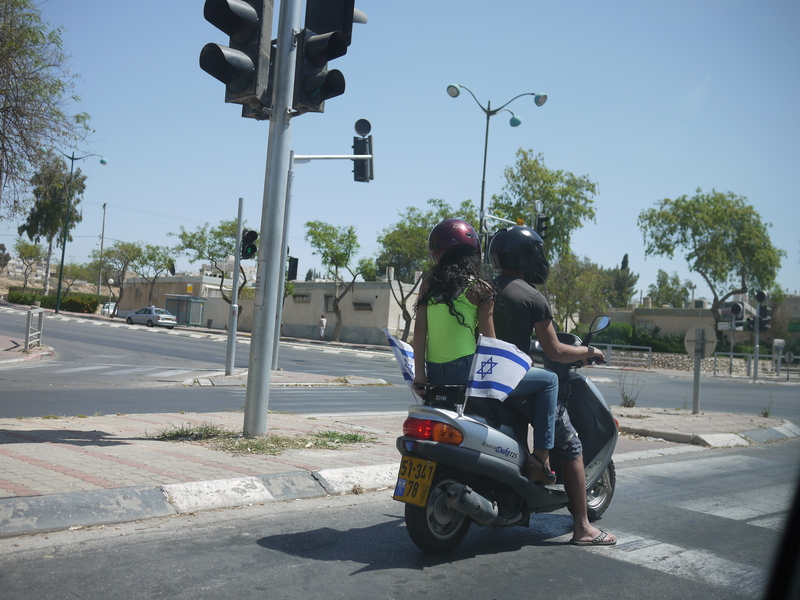 As we arrived in Be’er Sheva, Independence Day festivities were beginning. Men dressed in white shirts and dark pants walked to evening davening, where special prayers, including Hallel, prayers on behalf of the Israeli government and its soldiers, and Psalm 126 were recited; and like Yom Kippur, they said “HaShem Hu HaElokim” three times and then blew shofar. Afterwards was a simple but delicious catered meal for the shul families which included grilled chicken, shnitzel, and many types of Israeli salads, followed by a children’s hour of dramatically told stories about Memorial Day and the fight for Independence and recognition of the State of Israel, along with singing that left the children mesmerized and excited. As we made our way home, we suddenly heard “Boom! Boom!” but since there was no air raid siren, we realized it was not a missile attack but instead it was a fireworks display coming from the direction of the University. 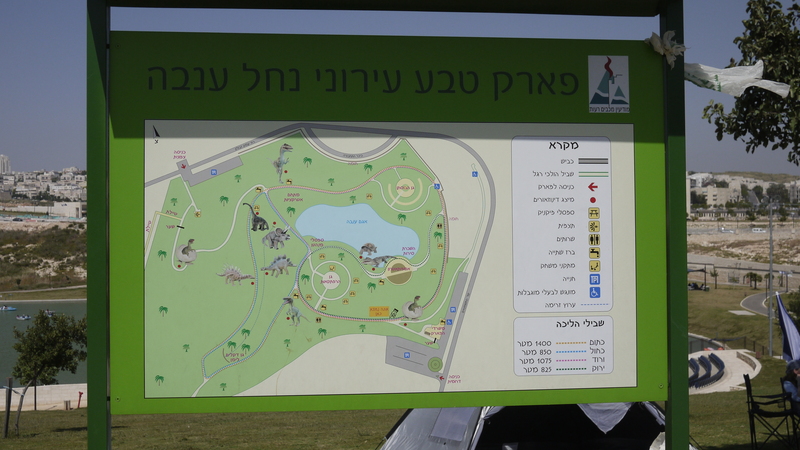 Tomorrow we will go to a “mangal” at a park – – Hebrew slang for bbq – – which is the typical mode of celebration throughout Israel in honor of its Independence Day. So now the part that makes me sound like a sentimental old lady: when I looked around the shul and saw all ages participating in the festivities, it brought tears to my eyes. It was a very sentimental and beautiful celebration that really brought forth an awareness of just how miraculous is Israel’s existence, and how clearly HaShem has bestowed His blessings and grace upon the Jewish people. We do belong here. How dare we reject this amazing gift from Above? We booked tickets to go to Israel from Portland, Maine to Newark to Tel Aviv. There were three hours between flights in Newark, so I thought we’d have plenty of time. When we checked our luggage in Portland, they were not too encouraging. “Now you tell me!” I replied. Indeed, high winds in Newark meant the airplane was stuck in Portland since air traffic control wouldn’t clear us for takeoff. The flight was delayed for 2 hours and making the connection in Newark was questionable. The flights to Israel for the next two days were completely booked so a delay would spell disaster. We had to make our flight! 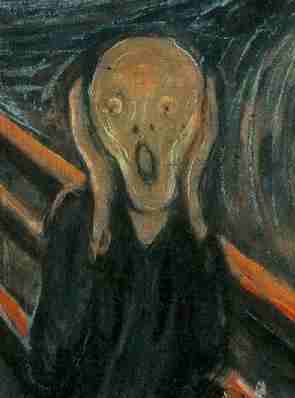 “So I’ve heard!” I replied, feeling somewhat morose. Suddenly the loudspeakers announced that our Portland plane, a small 15-seat jet, was boarding. They rushed us on board, literally throwing the suitcases into the overhead bins. “They always cancel this flight,” said the stewardess, “and I want to get out of here before they change their minds! Please,” she added with desperation, “Hurry!” The last person had barely entered the airplane when the door slammed shut. The anxiety of the crew to get this plane out at all costs before Air Traffic Control would change their mind was so palpable, I felt like I was on the rooftop of the American embassy in Saigon awaiting the last helicopter out of Viet Nam. Fortunately when we arrived at Newark we were able to immediately board the shuttle from Terminal A to Terminal C, and then get on an electric cart which whisked us to our gate. A very kind flight attendant who was aware of our dramatic rushed connection greeted us at the door of the plane. The flight attendant told us to relax and enjoy the flight, and that the flight atttendant would “visit” us later during the flight. We thanked the flight attendant but thought nothing more of it, and we made our way to our seats. The nearly full plane appeared to be a pretty even mix of secular Israelis, tourists, and chassidic men aged 18 – 20. At one of the bulkhead seat rows, which had a very large open space in front of it, I heard two secular Israelis congratulating themselves on their good luck with their great location with the ultimate in leg room. The third person in their row, who was another secular Israeli, burst their balloon. 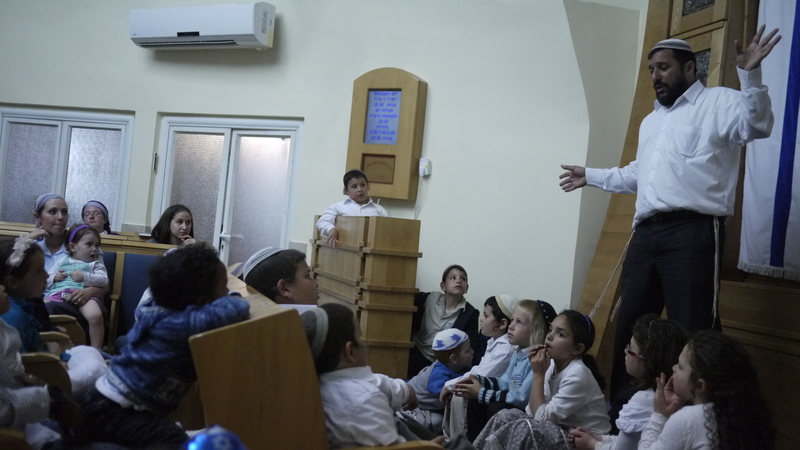 “Don’t you know that you are sitting in the ‘beit midrash‘?” (“synagogue”) he said. “This is where they (pointing to the all the chasidim) come to pray!” It took extreme self-control for me to not burst out laughing at the look of utter horror and panic on their faces. My husband and I both prefer aisle seats, so we reserved seats that were next to one another but with an aisle between us. Next to me on the left, the middle seat was empty, but the window seat was soon taken by Bubba from Mississippi. As the plane began to fill, twelve chassidic (Sanz, Vizhnitz, and Satmar) bochrim (young men ages 18 – 20) were sort of standing around our area of the plane, but none of them were sitting down. Suddenly they started negotiating with the passengers, asking them to move their seats, but passengers couldn’t be convinced to move from aisle or window seats to middle seats or for husbands to sit away from their wives. It suddenly occurred to me: they didn’t want to sit next to female passengers! The stewardess kept asking them to sit, but they played the “Yiddish card” as if they didn’t understand her request (they did, as they were from Brooklyn, and even though their English was heavily Yiddish-accented it was still fluent). Meanwhile Bubba asked me, “Why won’t they sit down?” and I tried to explain why the men hoped to avoid contact with women who were not first degree relatives. “Way-ell, they-a jus’ better git used to it!” he said. “An’ why they got them funny things hanging down their ee-yuhs lahk a houn’ dawg?,” referring to their payos. The young men practically ran to their assigned seats like lemmings to the slaughter and buckled up. One poor fellow, clearly miserable at his fate, twisted his very tall frame completely away from the elderly woman in the middle seat next to him, crossing his legs tightly and planting himself on the far opposite edge of his seat, pulling into a fetal ball. He was going to be very stiff and sore after the 11 hour flight! Other boys discussed whether they should simply remain standing for the duration of the flight. Shortly after takeoff, the flight attendant who had spoken to us earlier approached. “Can I get you anything?’ The flight attendant then gave us a present: a fancy toiletries case with the airline’s logo embroidered on the front. The chassidim looked at us quizzically, wondering who we were that we got such an impressive freebie all the way from First Class. One of the young chassidic men kept asking the stewardess when the plane’s duty free shop would open. “In a few hours” was her constant response. Since the duty free catalog didn’t seem to have any real bargains, we were wondering what he was interested in purchasing with such urgency. As we passed over London, the duty-free store on the plane opened for business, and the chassidim announced it was time for shacharit (morning prayers). One minyan congregated by the aforementioned secular Israelis who were sitting by the bulkhead, and the other group clustered at the back of the plane in the galley. “I’m giving you 30 minutes, and then you must sit down,” said the exasperated flight attendant. Right after davening one of the chassidic boys asked my husband if he would mind buying something for him in the plane’s duty-free shop. “They von’t take my cash” (he pronounced it, “kesh”) and asked my husband if the boy would pay him the cash, would my husband mind using his credit card to buy some single-malt scotch. My husband wasn’t sure the boy was 21, so he didn’t feel comfortable saying yes. Instead he said, “Come on, what do you need to drink liquor for so early in the morning?” But the boy would not be deterred and as soon as he was seated, we noticed him passing out “lchaim’s” to all the other boys along with post-davening kichel, thanks to a different passenger who was more accommodating than my husband. A little while later our “personal” flight attendant came by again. “Can I get you anything to make you more comfortable?” The bochrim started eyeing us with interest. “How about some wine on the house?” the flight attendant asked, and whipped out two wine glasses and some Barkan Cabernet Savignon. The chassidic bochrim’s eyes nearly popped out of their heads. Surely we must be VIPs! One of the chassidim couldn’t stand it anymore – his curiosity was killing him. “So!” he said as he approached my husband in his seat, “vot do you du?” Clearly, despite our simple appearance, he thought we were millionaires and philanthropists worth getting to know. He told my husband that he was looking for ways to make money and wanted to know if my husband knew anything about the stock market. This segued into a discussion about parnassa (making a living). The fellow knew only that he wanted to make a lot of money, but had no idea how to accomplish this. “It’s all from Above,” he said confidently, looking towards the heavens. My husband started discussing the concept of hishtadlus – being proactive and showing HaShem that you are making an effort instead of sitting back and waiting for Heavenly reward. He told the young man that it was important for him to find out what he liked and what he was good at, and then try to focus on acquiring related skills so that he wouldn’t have to go knocking on doors collecting charity. “Vell, I like math,” he said. “I heard you can make a lotta money as an actuary.” When my husband asked him how much math he had under his belt – – er, make that gartel – – , he said he had never studied secular subjects since elementary school. My husband saw that what this boy really needed was a rich father-in-law. Before landing I spoke with our flight attendant, thankful for all the special treatment. I asked how the American-born non-Jewish flight attendants handled the cultural differences, customs and attitudes of passengers on the plane. “Oh, they’re used to it,” was the diplomatic reply. “Yeah, but how do they feel about it?” I asked. For the past couple of nights I have had some disturbing dreams. The details are unimportant, but the theme is this: I over-commit myself, which leads to my trying to please everyone and be everywhere at once. The result is that despite my good intentions, I accomplish nothing. As I become more and more overwhelmed, I become increasingly careless and reckless in the frenzy to honor my commitments. As my mother a’h would have said, I’m “running around like a chicken with its head cut off.” My behavior results in neglect and abandonment; and despite my desire to do good, not only do I fail, I disappoint those closest to me. Needless to say, I awaken with tremendous anxiety. Thankfully the actual scenarios in my dreams were fantasy, but the symbolism was unfortunately all too real. Friend A hosts a monthly gathering for 80 people from all walks of life, who come to hear amazing lectures from experts in diverse fields of science, medicine, and philosophy, tied into religious themes. She organizes the speakers, supplies most of the food, sets up the chairs, cleans up afterwards. Yes, people help her, but this is also after a week of her regular activities when she cares for an elderly parent, shops and cooks for people who are ill, helps out a daughter-in-law who is overwhelmed with childcare (and for whom she babysits several hours every weekday morning), and for whom she does carpools and many of her household chores. Friend B works very hard to make ends meet. She tutors children with learning disabilities (rarely getting paid on time). She not only has a crowd of Shabbos guests every Shabbos, she has “regulars” who practically live at her house (some actually do live there for weeks at a time who literally have nowhere else to go). She has serious chronic health issues of her own that make any exertion extremely trying. She does get help from others, but it’s simply not enough. Friend C has a very large family. She works full-time so they can make ends meet and pay tuition for their children in day school. Besides factors in her workplace that necessitate much preparation at home beyond the normal work hours, she also on a daily basis mentors people by phone who have tremendous life struggles and are extremely needy. Despite a weekly housekeeper, her house is in constant disarray, and her children have behavioral issues that are especially challenging. No matter how much attention she gives them, it’s not enough. All three of the above people are in good marriages with supportive partners. I can’t even imagine how much more difficult it is for single parents who are undoubtedly even more overextended! As Jewish women, the tradition and mitzva of chesed (acts of loving-kindness and doing good deeds for others) is the foundation of who we are and all we aspire to become: a true eshet chayil, a “woman of valor.” We read biographies of tzaddikim (righteous people) for further inspiration. We give our all in this world in preparation for olam haba (the World to Come). I have it so much easier than most people; and still, I struggle. I know I cannot be the only one who feels “why can’t I measure up?” and lives with the resulting guilt. I want to face the trials handed to me with love, happiness, bitachon (trust in HaShem), a positive attitude and a sense of triumph, instead of dread and the feeling of failure and guilt. A certain rabbi once gave a lecture and talked of the irony of women who get so into their prayers or recitation of psalms, that they ignore the needs of their crying child during that time, even to the point of neglect. How do we learn to say “no” gracefully? Or do so without guilt, fearing that we are somehow not reaching our potential? Or the belief that “God doesn’t give us more than we can handle?” – – but what if we fail? How can we follow halacha (Jewish law) when circumstances contrive to impede us? I have been doing some serious introspection on how to work on this problem. Besides asking HaShem’s guidance, one very little thing I can do is make a list of things I hope to accomplish the next day, and at the end of that day, to revisit the list, and do a cheshbon nefesh (personal accounting). Perhaps things that seemed important will not be as urgent as I thought. Maybe it will encourage me to prioritize and be better organized and manage my time more effectively. For those things I was unable to accomplish, maybe I will be able to complete them the following day. Maybe that day’s list will be realistically shorter! Perhaps if I take difficult things a day at a time – or if they are really difficult, a moment at a time, they will be more tolerable. And maybe my dreams will be calmer. I’d like to hear your suggestions! As a photographer, I especially appreciate the creativity of those who go beyond the usual parameters of portrait photography to create something truly memorable. 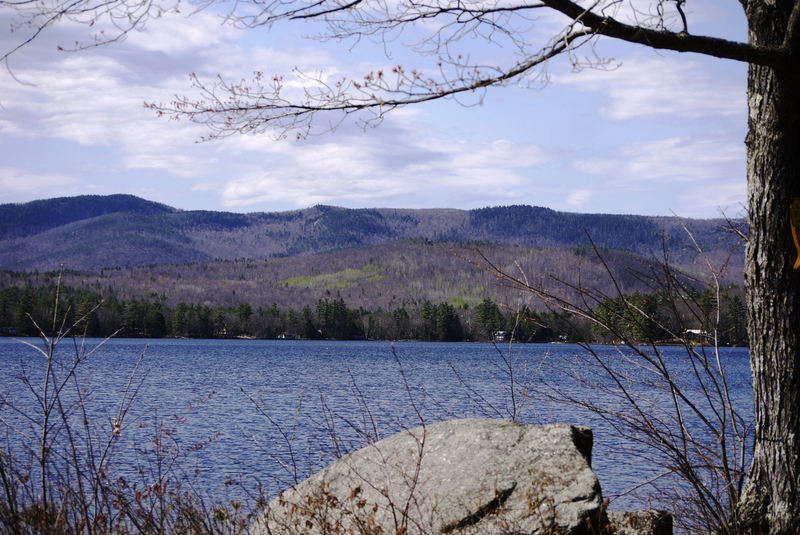 Although this blog-post has nothing to do with living in Maine, sometimes something is so noteworthy it begs to be shared. Jason Lee, you are a genius! 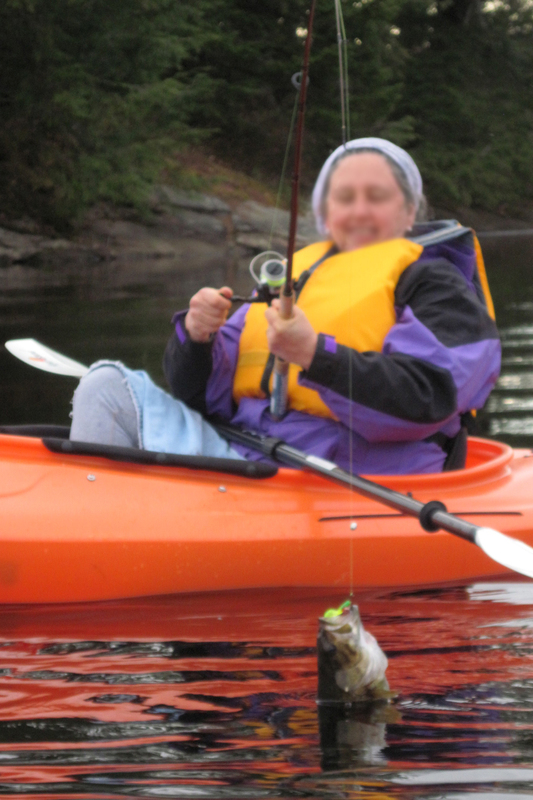 I guess my beginner’s luck is over because I caught nary a fish yesterday while kayaking on Keewaydin Lake. I’m not complaining – – I had the entire lake to myself today and it was perfect weather: in the 70s, a light breeze so no bugs, plenty of sunshine and deep blue skies. Spring is definitely here: with the warm weather, employment abounds for the locals, who act as caretakers of summer homes as they open water lines and flush pipes from the antifreeze they put in right before the onset of winter. “Winterizing” and “summerizing” vacation homes is a big business for full-time Maine residents, and although local Mainers may sometimes resent the summer people (a passive-aggressive love-hate relationship), they also know they depend on the income generated from property management, food and boat concessions, guided trips, and construction and rentals of cabins, etc. to survive. More than half the property tax collected in our town is from people who use their homes only in the summer, and without that income the town wouldn’t have the funds for road maintenance, its volunteer rescue squad, etc. For those fortunate (and rich) enough to have lakeside homes (besides the much higher real estate valuation for shore properties, property taxes are double) docks are moved from the shores and anchored on lakes and ponds. Car-top carriers are now festooned with kayaks, canoes, and mountain bikes. I’m enjoying it while I can – – the worst of bug season typically lasts from Mother’s Day to Father’s Day (May through June) and at that point going outside is all but impossible without loads of “bug dope” like Deet and a bug net to protect one’s face from the onslaught of merciless bites, stings, and the resulting interminable itching which can make even the calmest person go insane. 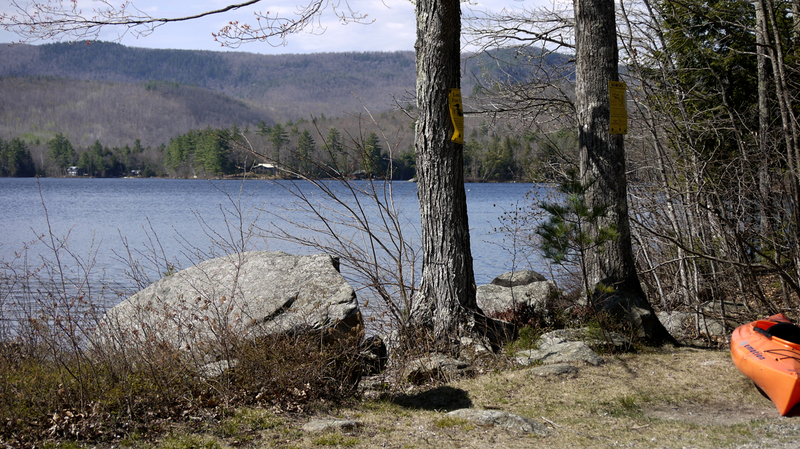 This elderly couple and their property caretaker install their dock on Kezar Lake. 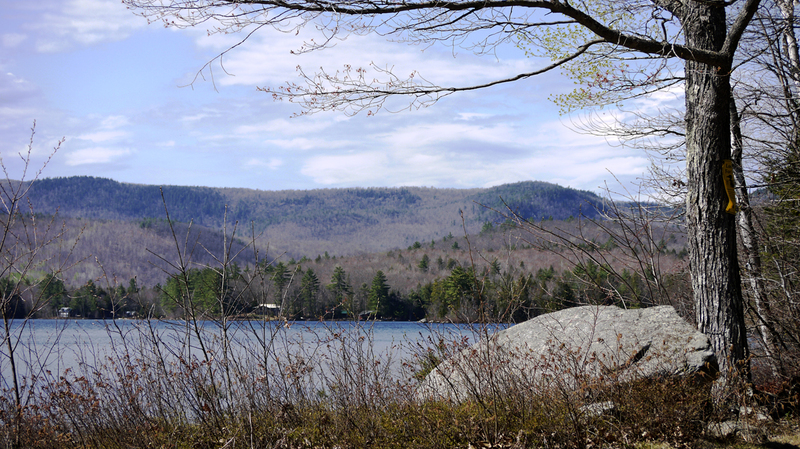 Lakeside properties are owned by "old money," corporate executives, and a few media stars (including author Stephen King), and can run in the millions. I once hired a woman to help me paint my shed. As we worked together from the early morning until the afternoon, she told me she wanted to take a break to call and check on her 13-year-old son, who she had left home alone. She wanted to make sure he was keeping busy and staying out of trouble. So last year we bit the bullet and shelled out the $64 for a non-resident annual fishing license. Since it was so expensive, we bought only one, in my husband’s name. The game wardens are quite strict around here about checking licenses, and the fines are quite high (in the hundreds of dollars) if you are caught fishing without a license, so I didn’t try fishing myself. But I might as well have, since I did just about everything else. It turns out that my husband gets really grossed out by putting a worm on a hook. So clearly if we wanted to catch a fish, I would have to handle the bait part of it. It didn’t seem fair that my husband would get all the glory if he actually caught a fish. Alas, after several mosquito-ridden and fishless attempts, we closed out the 2011 season with nary a bite. (We did get a few nibbles but the fish managed to eat the worms off the hook without getting caught). So this year, we once again shelled out the $64, only this time I registered the fishing license in my own name. I figured if I was going to do the nasty job of threading the worm on the hook, I could at least get some enjoyment out of possibly catching a fish, too. Besides, my husband’s hours are much less flexible than mine, and I have more opportunities to go fishing than he does. That said, I really have no idea what I’m doing: I don’t know if the weight of my fishing line is correct, if the type of hook I’m using is good, or if the bait I’m using is the right kind. But what the heck: the weather has been beautiful, the water smooth as glass, and it’s a good excuse to go kayaking. First I went online to the Maine Dept. of Fisheries and to see if they’d stocked any nearby lakes or ponds. The website said that on April 5, they put 400 10-inch brook trout into Keewaydin Lake, which is only 6 miles from my house. So at least the odds were good. 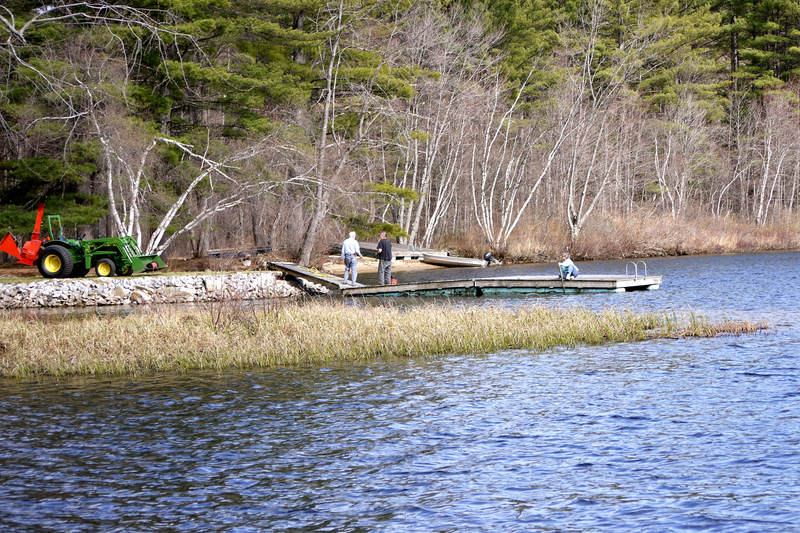 Keewaydin Lake is home to many types of fish, including bass, togue, trout, pickerel and land-locked salmon. Truthfully, even if I did catch a fish I wouldn’t be able to tell you what type I caught. As long as it had fins and scales, I would worry about that part later. I went to our local mom-and-pop store and asked which type of bait I should buy from the choices in his refrigerated section: trout worms, dillies, or night crawlers. “Well, that depends . . . what type of fish are you trying to catch?” asked the storekeeper. “Anything that bites!” I replied. “Though I have a feeling that the only fish I’m going to be eating tonight will be from a can. But I heard that they stocked the lake with brook trout, so I guess I’ll try for those. Although I’ve heard trout are wily and hard to catch,” I added. With a vision of 400 trout swimming over to my kayak begging to be caught, I bought trout worms. My husband and I set out on the lake in our respective kayaks. Along with an artificial lure that I bought at WalMart for $.40, I threaded the squirming worm onto the hook , while my husband looked away, visibly sickened. We slowly paddled about but the fish weren’t biting. I headed for a sheltered cove, figuring the fish would find comfort there (don’t ask me why I thought this warm and fuzzy thought – – I was thinking like a nurturing mom, which is ridiculous because I was out to kill for my dinner). My instincts proved correct! Within moments my pole began to arc and the line grew taut. I had a pretty decent-sized fish on the line! I reeled it in and yelled to my husband to grab the fish and put it in his boat. Unfortunately we both realized why fishermen carry nets. We had no way to grab the writhing fish from the end of the line and put him into the (I mean, my) boat. The fishing pole was too long for me to reach the fish, so it would be up to my husband to unhook him. Tomorrow, if the weather holds, I’m going to try again. And this time, I’m going alone.